Leave Hastings @ 2pm. Motor-sail to Flinders, arrive @ 6pm. We had been telling people that we planned to leave on Friday 9th June, knowing this wasn’t locked in for certain until the minute we actually left. There was still a list of jobs waiting for Simon on Friday morning, and he got stuck into it straight away. It was a busy day and then suddenly there we were doing the final pack-up of tools and food. And that was it – we were off – waving goodbye to my Dad on the jetty. Markito (8y/o) was in the front berth and got excited when he was thrown around as we came off some big waves. He moved around the boat with confidence and ease despite the jolting movements. He was Captain Simon’s first mate – his most important job being to adjust the auto-pilot coordinates. Zach (3y/o) fell asleep on the couch before we reached McHaffies and slept through the whole thing. Too easy. Freyja (3y/o) sat up on the couch in the saloon and watched everything through the window. She was calm and every now and then would give someone a big smile. She was all over this sailing gig. Simon (captain) was focused, organised and solid as a granite rock. He was also loving it! Mayra (blogger), well, I got seasick. I felt yuck and cold and all I could do was stand in the cockpit, hold on, and watch with great intensity as we powered through each wave and rolled around on the ocean swell. I couldn’t talk and sometimes my knuckles went white I was gripping so hard! Overall the Captain was very pleased with how his crew handled their first experience of rough ocean. No-one threw up, no-one injured themselves, and Markito, in particular, found his feet fast and was incredibly helpful. 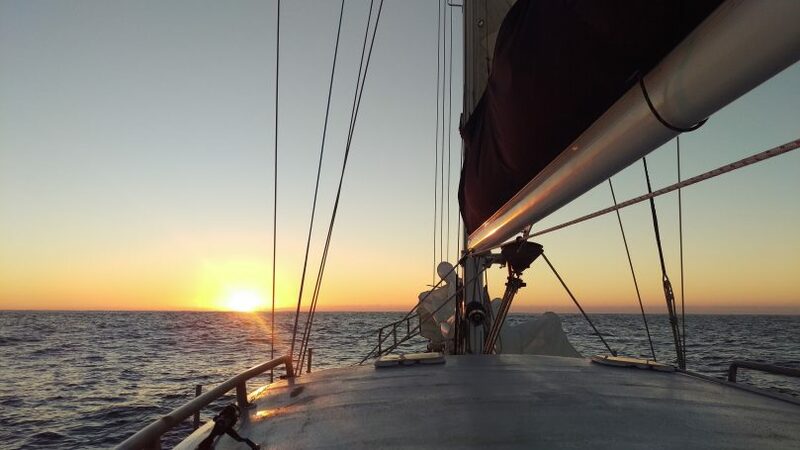 After McHaffies Reef the ocean was calm again and we arrived at Flinders just as the sun was setting. We dropped the anchor and watched as a beautiful full moon rose over the ocean. Calm sea and sun shining through the clouds as we say goodbye to Hastings and head off on our adventure. Leave Flinders @ 7am. 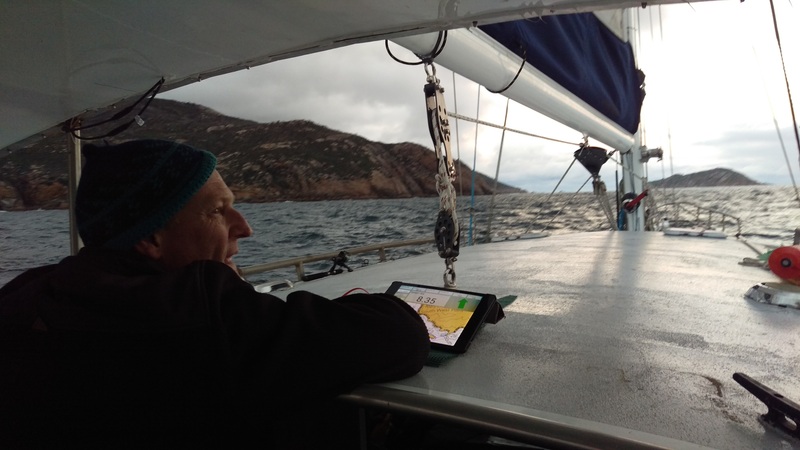 Motor-sail to Refuge Cove, Wilson’s Promontory, arrive @ 7pm. Our first full day of sailing. It was exciting getting up early and setting off as the sun was rising. 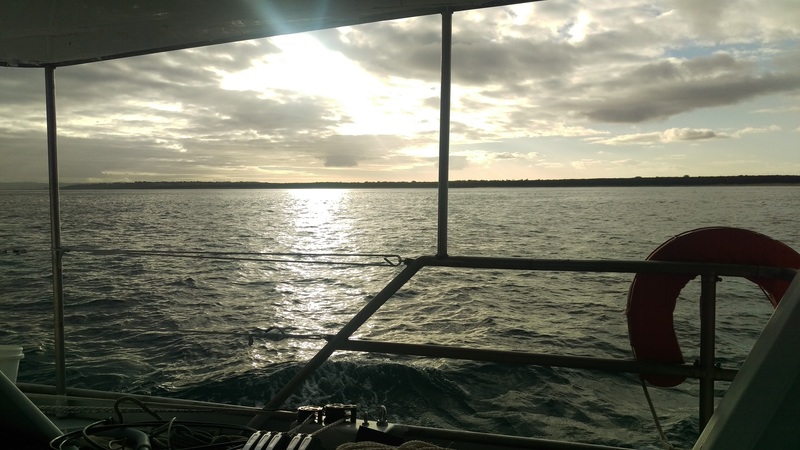 I felt a bit of trepidation about feeling seasick again, but there wasn’t much wind and the ocean was calm. Rather than seasick, I felt fragile and tired. If I moved around too much it would trigger the nausea, but if I stayed still I felt ok – so after helping with the departure, I went back to bed and spent most of the day listening to podcasts or sleeping. Simon was in charge of the boat and the kids. The highlight of day 2 was seeing dolphins. How incredible! Only our second day and already we were having such a classic sailing experience. Simon and Markito saw them first. Then later, when I was sitting up keeping watch so Simon could take a break, they came back again. For about half an hour the kids and I watched a pod of dolphins swim alongside the boat. They felt so close, sometimes leaping out of the water and then disappearing. Very cool. Simon keeping watch as we pass between South Point and Wattle Island – the most southern point of mainland Australia. Wow what a view! 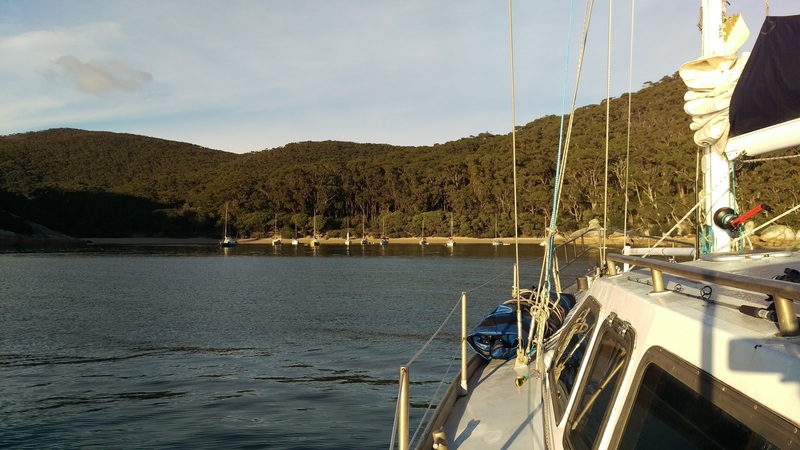 Having arrived in the dark the night before, I didn’t see what our anchorage looked like until I got up this morning. 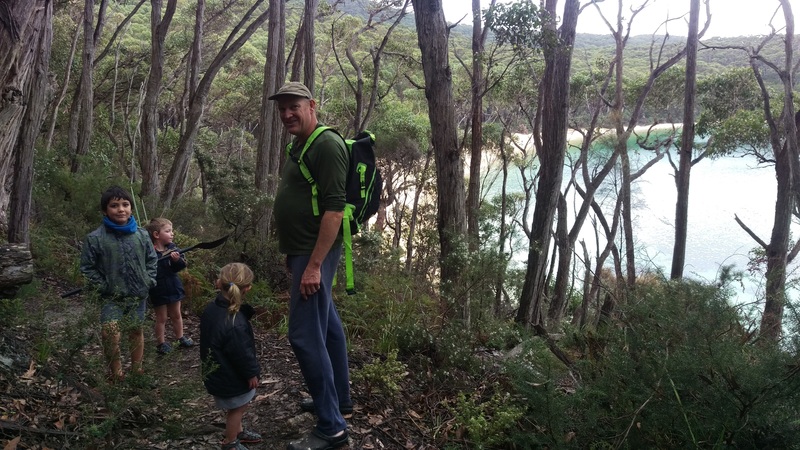 There are two beaches, separated by steep hills covered in thick bush. 11 small yachts are anchored close to one of the beaches. The water is clear and the sun is shining. Every day we are doing something for the first time. Todays ‘first’ was using the dinghy that Simon built. He’s tested it out around Hastings, but today was the first time the rest of us had ever been in it. 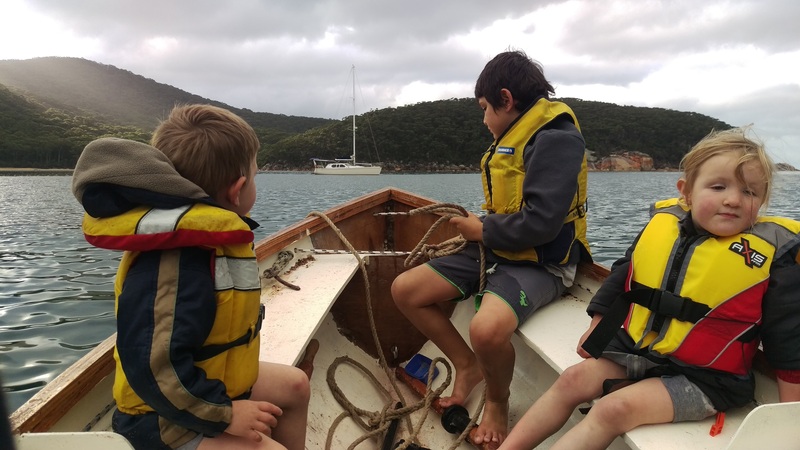 It felt like a special occasion as we all got dressed up in our brand new life jackets, leaving behind the simple ones the kids wear on the boat. Zach and Freyja call the dinghy ‘Dad’s little boat’. They were both excited and wanted the dinghy to go faster and faster. We had a lovely time hanging out on the beach and spent the afternoon napping and cooking on the boat. Our first ride in the dinghy. 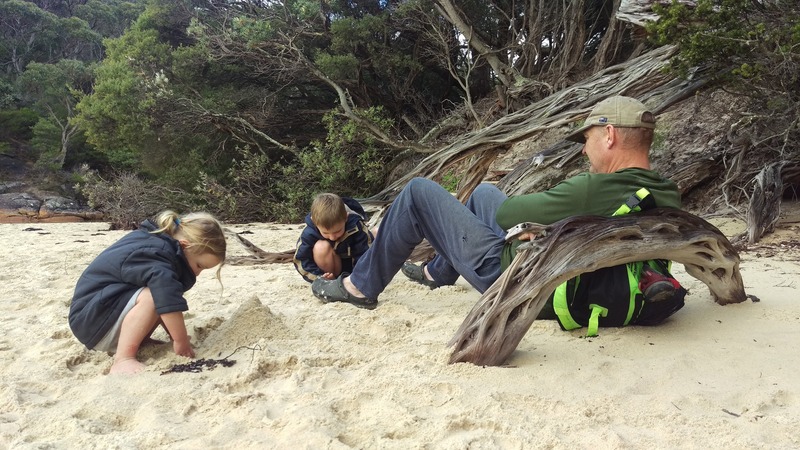 Refuge Cove, Wilson’s Prom. After doing so much work to prepare for this trip, spending some time relaxing at the beach felt great. No sailing today. Just hanging out at Refuge Cove. It was cold and drizzly so we spent the morning on the boat. 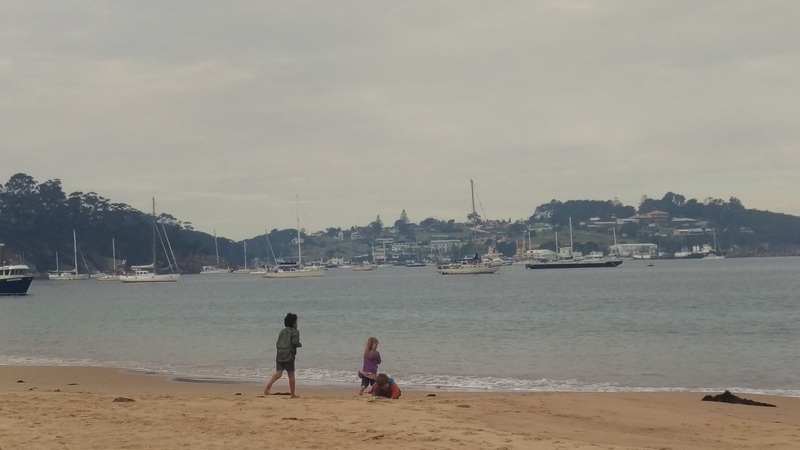 Then in the afternoon we hopped in the dinghy and scooted across the bay to one of the beaches. The sign told us it was a 20min walk round to the other beach, so we headed off, following a narrow dirt track through the bush. Freyja: Yes, that’s right Zach. They are big rocks. They’re my favourite. Zach: Uh oh, there’s some big steps, they go up, up, up. Freyja: Those steps are bigger and bigger. And look, there’s a tree. It’s a magic tree. Zach: It’s not a magic tree Freyja. It’s a scary tree. Freyja: Ok, a scary tree. Uh oh, the path is going down, down, down. Zach: Down and down. Watch out for that big rock. It’s a big one. Freyja: That’s the biggest rock in the whole world. And on, and on, and on, and on in their little 3 year-old voices, walking at a 3 year-old pace, with the rest of us stepping in line behind them – except for Simon who quite enjoyed encouraging their chatter with his own inspired ‘oh wow, look, there’s a tree’ comments as we walked through the bush surrounded by trees. Our first ever anchorage. Such a beautiful place! Leave Wilson’s Prom @ 6am. Motor-sail all day and all night. The beginning of our 36 hour sail started well. We were crossing what is locally known as ‘The Paddock’ and there were a few times today when I couldn’t see land. I had imagined the experience of being totally surrounded by ocean would be more, umm, spiritual? or meaningful? or maybe even scary. In reality though it was no big deal… just another ‘first’ among so many for this week. The good news today is that I’m not experiencing any seasickness. Hooray. So what do 5 people do aboard a boat all day? Watch videos, listen to podcasts, read books, timetables snap, play cards, sit on the couch and stare blankly out the window, stand up in the cockpit with your face in the wind, eat snacks, try not to spill any drinks…. and most importantly of all, keep an eye out for dolphins. 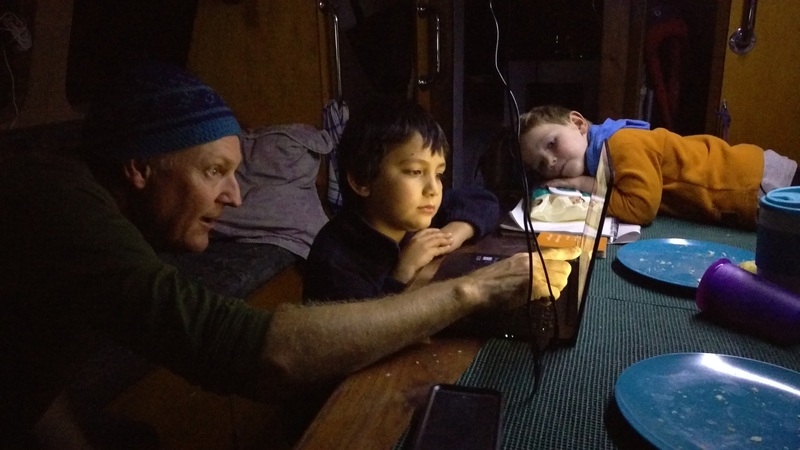 After dinner – Simon showing Markito where we are going on the map and explaining how the program works. Zach wants to know too. Motor-sail all day. Arrive in Eden, NSW @ 4.30pm. We did it! Phew! We’ve arrived in Eden. Today was more challenging than yesterday because from about 10am we were sailing into a headwind so it was a little more uncomfortable. Still – everyone did really well. And the most exciting thing of all: we saw WHALES. Yessirree. There were two whales in particular who we watched for a long time. We saw them 3 different times over the day and were able to watch them for half an hour or more each time. At one point they were only about 50 metres from our boat. They didn’t do any huge spectacular leaps from the water, but we did see them do some small breaches, and blow air out, and we watched their flippers slap against the water as they rolled over. We think they were southern right whales and feel very privileged to have been able to accompany them for a while on their migration north. Oh yeah, and we also saw dolphins… again. Unfortunately no photos of either – you’ll just have to take our word for it. 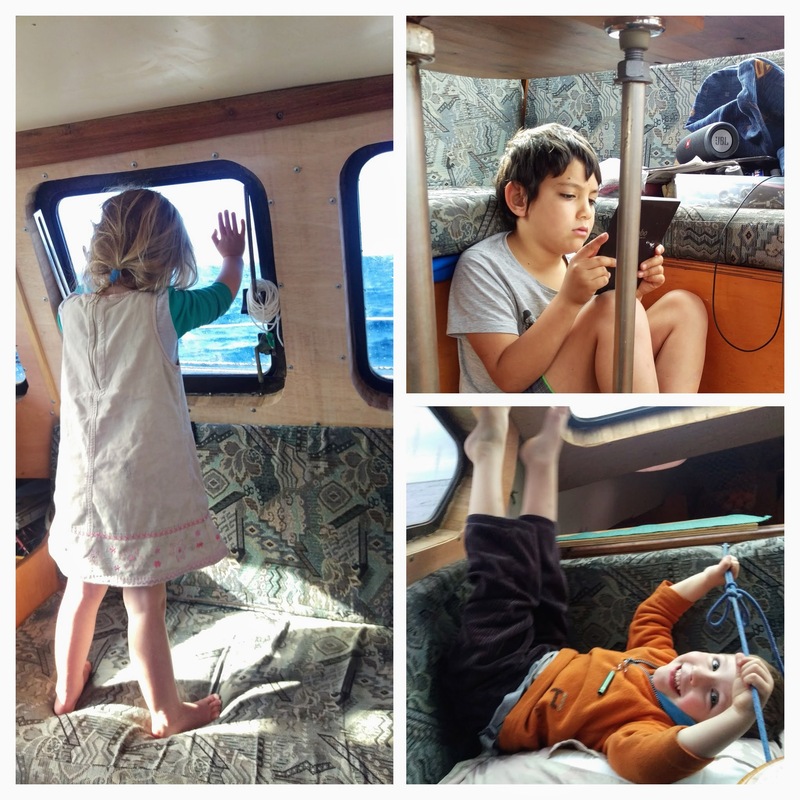 The kids during their first 2-day sail: Freyja watching the whales, Markito with a good spot under the table for some reading, Zach playing on the couch. No sailing today. Just hanging out in Eden. Ah Eden, what a lovely town. The first thing we did after breakfast this morning was hop in our dinghy and head over to another yacht anchored not far from ours. 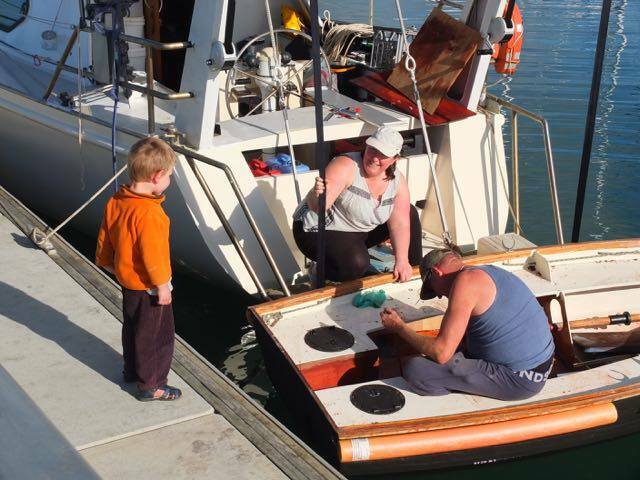 We had waved to their kids when we arrived and suspected they might be a family we had seen posting in one of the sailing facebook groups we belong to. Our new friends told us where we could take our rubbish and engine oil, and after getting those jobs done we met some of them at the beach for a play at the playground. It was so wonderful to spend time with another family living the same lifestyle as us – we had so many relatable experiences to share. Next up was another dinghy trip over to another beach and a walk up a steep hill into town and to the supermarket. We walked back to the dinghy all loaded up. Simon and I each carrying a super heavy water-proof backpack full of food, and Simon and Markito carrying another three bags between them. As we walked Simon turned to me and said: “So this is our life now. We walk everywhere. We carry our shopping in backpacks. We get to places in the dinghy. We are constantly putting on and taking off our lifejackets. What do you think? Wanna keep going?” And with a big grin I replied, “Yep! Bring it on!” (mind you, I did ask for a shoulder massage later coz that bag was really bloody heavy!). Playing at the beach in Eden.